This 5-day immersion is a journey into our True Self—and an exploration of the bridge between the soul’s essence and purpose. Join Darshana on a voyage into the synthesis of ancient teachings, and the new heretical knowledge of Human Design. 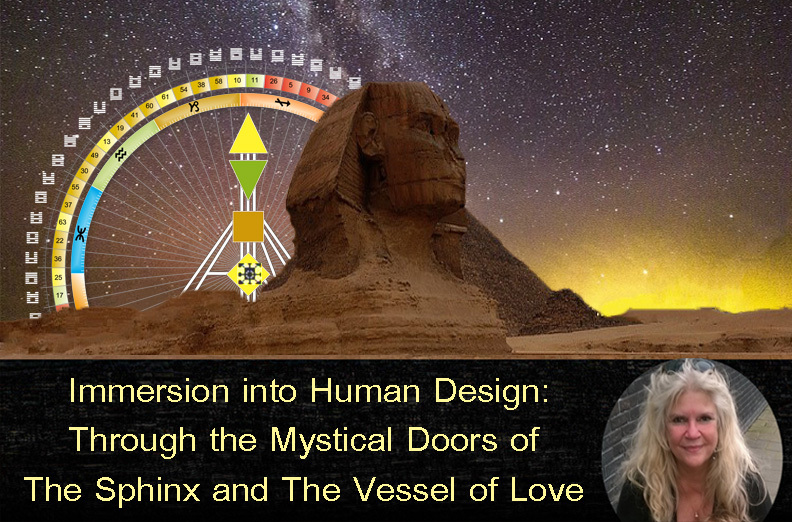 We enter this mystical realm through ‘The Vessel of Love’ and ‘The Sphinx.’ These two ‘Incarnation Crosses’ are found in the G Center, the center of the Higher Self. It is here that the magnetic monopole rests in our design. It’s job? To hold the two prime Crystals of Consciousness in place for this embodied human odyssey of love and life. “The Sphinx” is what holds our movement in time through space. This Cross brings an innate sense of inner direction. “The Vessel of Love” Cross permeates and binds the universe, pulling everything towards our original state of oneness. Through the understanding of our design, and the grounding in presence through awareness; we begin to surrender to the direction of our form. This surrender aligns us with our unique purpose and brings to expression the fullness of love. As we relax into our Being, our Passenger; we enable the flow of the Consciousness field to stream through us; and dance in the differentiation that we are here to share. The Vessel of Love holds the portals to the 4 gates of love – the tantric love of the body, the tantric love of humanity, the love of the Self and Universal Love. The Sphinx holds the portals to the 4 gates of direction – the direction of looking back, the direction of looking forward, and the direction of our self towards love and beauty as our purpose and the drive, and deep need to for creative expression of our self – in the now. The first path is the mental path, at the conscious level. We work with Human Design, a mechanical and logical system; which is designed to use the mind, in order to defeat the mind. This knowledge gives us the tools to consciously align with our True Self and see through the density of the illusions our mind builds around our world. The second path is the physical path, a mystical path unveiling itself over time; below the conscious awareness. This path works where awakening happens, to find our differentiation. The profound knowledge of The Human Design System will provide you with an understanding that will move you deeper into experiencing your precious, unique frequency and your essential, vital aliveness. As we journey through these days, moments of revelation will await you… Moments where ‘that’ which has been behind the veil, comes to the surface. Moments when you will see through the shadow-world of conditioning – into the magic and mystery held by the Crystals of Consciousness resting within. We will deepen our understanding of the meaning behind the Crystals of Consciousness; as well as explore our unique design through the Human Design System; through the teachings of Human Design, through inquiry and through meditations. There will be sharing, journaling and wild mind writing to allow for the unconscious to surface with its wisdom and creativity. Participants are required to have a basic understanding of their own design through the Human Design chart. There are many free resources online at www.jovianarchive.com/Media_Library and you may get your free Rave Design chart here. You are warmly invited to have a personal foundation reading before meeting for this profound awakening experience in Italy. Please contact Darshana directly at darshana@human-design.org for further information. What to bring – booklets and pens for journaling. Soft clothes for comfort. Shoes for exploring the mountain. Also… an open heart and adventurous mind to enjoy the journey! This gathering together is held at the newly built, majestic Mandali Retreat Center, placed high in the Italian Alps, over-looking Lago d’Orta. This is simply an exquisite place. The Mandali Retreat Center was built from the vision of supporting our Essential Being through beauty, peace, comfort and conscious care; and that it is essential for us to take time for ourselves in sacred places. I am absolutely delighted to share my creative, beautiful friends who have created this magical mountain-top retreat, with you. Through the teachings of Human Design we will explore the mystical mechanics of our maia; nourished under the vast sky—closer to the breath of the stars—on a journey to go through the doorway into our inner world. All of the practical details for the gathering are available on the www.mandali.org website. There will be transportation possibilities available from the airport near Milan – Malpensa Airport.